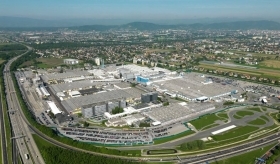 Magna International Inc. is contemplating a new assembly plant after securing a deal to build luxury sedans for BMW AG, which will help fill capacity at its flagship factory in Graz, Austria. Production of BMW’s 5-series will begin next year and adds to an agreement to manufacture vehicles for Jaguar Land Rover and Daimler AG, Magna said in a statement today. Magna, which said it expects to produce 200,000 vehicles per year by 2018, is considering adding production capacity in China, the U.S. or Europe within the next two years. The world’s largest contract manufacturer of vehicles is also positioning itself for the prospect that technology companies will eventually join its roster of customers, along with traditional carmakers. “You could easily have enough business outsourced from the existing carmakers to fill up other contract assembly plants, or you could have new entrants that come in and say ‘I really want to have something but do I really want to manufacture vehicles?,”’ Magna CEO Donald Walker said in an interview at the company’s headquarters in Aurora, Ont. If demand from new carmakers emerges, Magna may consider buying a plant in China or teaming up with a local manufacturer to build cars, Walker said. Auto sales in Asia’s largest economy have failed to keep pace with growth in manufacturing capacity. China’s automakers may utilize about 65 percent of light vehicle capacity this year, down from 77 percent in 2012, according to Dunne Automotive Ltd., a Hong Kong-based consultancy. In North America, lower energy costs and advances in automation are offsetting higher labour costs and making the region more attractive for new plant investments, Swamy Kotagiri, Magna’s technology chief, said in a separate interview. BMW will also build the 5-series at its own factory in Dingolfing, Germany. Magna has already built the X3 SUV and Mini brand models for the world’s biggest luxury carmaker. Magna expects revenue from vehicle assembly to jump to between $5.3 billion and $5.8 billion in 2018, from $2.4 billion last year, as production of the BMW and Jaguar Land Rover models ramps up. The decision on where to locate a new manufacturing facility will likely depend on the source of demand. Magna ranks No. 3 on the Automotive News list of the top 100 global suppliers with worldwide sales to automakers of $32.1 billion in 2015.